Combined heat and power (CHP) or cogeneration, is a highly efficient process that capitalises on the heat generated as a by-product of the generation of electricity. When operated correctly, CHP leads to significant savings with the potential to deliver up to 20% reduction in energy costs and up to 30% reduction in CO2 emissions. The technology has been successful around the world and is widely used in the Netherlands, Finland, Denmark and Germany. 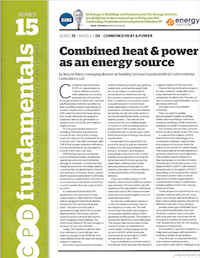 To find out more about the wide range of benefits and suitable applications for CHP, please read Wayne Ward’s article featured in October’s EiBI magazine.